The "new community" movement of the 1960s and 1970s attempted a grand experiment in housing. It inspired the construction of innovative communities that were designed to counter suburbia's cultural conformity, social isolation, ugliness, and environmental problems. 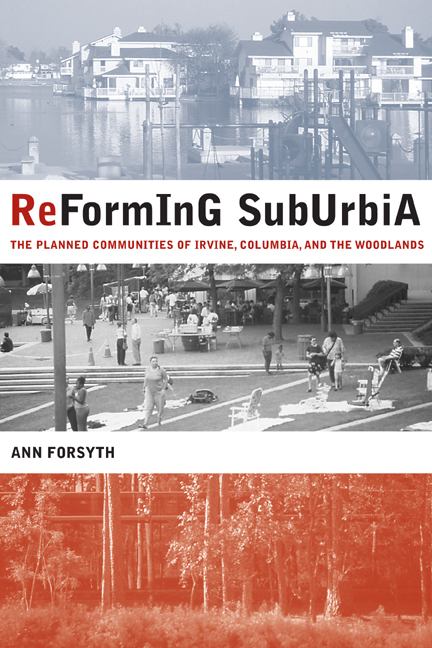 This richly documented book examines the results of those experiments in three of the most successful new communities: Irvine Ranch in Southern California, Columbia in Maryland, and The Woodlands in the suburbs of Houston, Texas. Based on new research and interviews with developers, designers, and residents, Ann Forsyth traces the evolution, the successes, and the shortcomings of these experiments in urban innovation. Where they succeeded, in areas such as community identity and open space preservation, they provide support for current "smart growth" proposals. Where they did not, in areas such as housing affordability and transportation choices, they offer important insights for today's planners, designers, developers, civic leaders, and others interested in incorporating new forms of development into their designs. 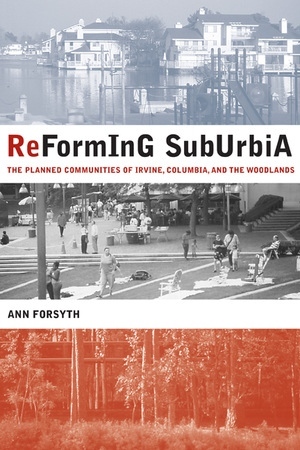 Ann Forsyth is Professor and Dayton Hudson Chair of Urban Design at the University of Minnesota and the author of Constructing Suburbs: Competing Voices in a Debate over Urban Growth (1999).